Don't throw out that empty glue bottle! You can reuse these for a variety of purposes - I use mine to make my own weathering washes. One of the liquid cements that I use is Tamiya's Extra Thin Cement which comes in a square bottle and has a brush applicator in the lid. When one is emptied, I leave the bottle open for any remaining glue to evaporate. 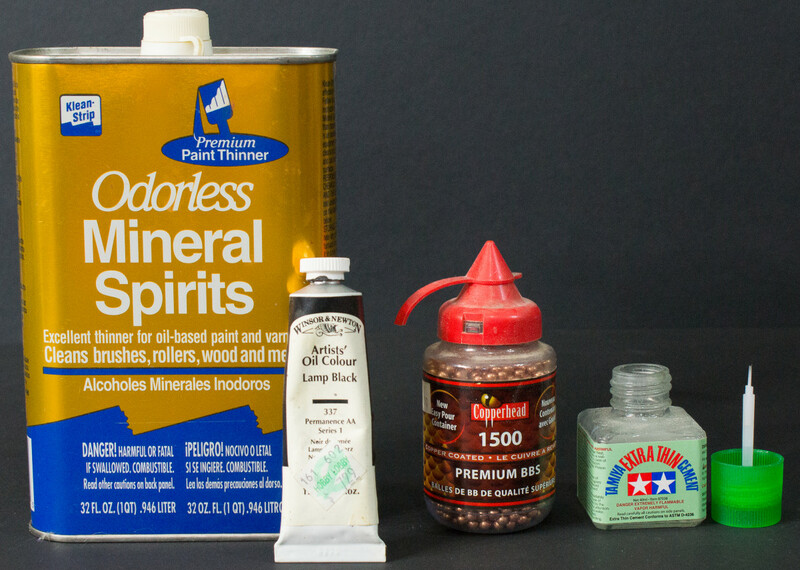 When the glue odor is gone, I drop a few BBs inside, fill the bottle with Odorless Mineral Spirits, and a dab of Lamp Black Oil paint. Now you have do-it-yourself black wash. Too thin? Simply add more Lamp Black oil and mix. Too heavy? Pour half into another bottle and top each off with Odorless Mineral Spirits. Adjust as necessary. In fact, you might want one thin and one thick mixture to handle different applications. This is one of my frequently used tools now as the mixtures can be used on panel lines, brushed over painted surfaces to wash out details, and many other special effects. Shaking the bottle before use is easier with the BBs inside to mix up the wash and the built-in applicator is perfect for weathering larger surfaces. Have more than one bottle handy? Mix up some Burnt Sienna for dark brown washes, and other colors as required. The materials are very inexpensive and are probably sitting around your bench now. I use Copperhead Premium BBs which I picked up at the local sporting goods store for aircraft ballast and the copper doesn't seem to mind mineral spirits or acrylics. The bottle of Lamp Black wash in the title image is going on four years old now (not counting periodic refills).